Once again after the hard work and patience Absinthe 2.0 Untethered iOS 5.1.1 Jailbreak is now available for general public who are using iOS 5.1.1 Firmwares on their Apple iDevices. For those users who have recently upgraded their iOS firmwares from old iOS 5.1 to the latest iOS 5.1.1 Firmwares can now easily Hack, Unlock and Jailbreak iOS 5.1.1 Firmware by using Absinthe 2.0 Untethered for iPhone 4S, iPhone 4, iPhone 3GS, iPad 3, iPad 2, iPad 1, iPod 4G Touch, iPod 3G Touch and Apple TV 2G. Pod2g and his iPhone Dev-team of iOS developer has managed to Jailbreak All Apple iDevices by using Absinthe 2.0 Untethered Method. Currently Absinthe 2.0 Untethered Jailbreak can be used on all existing iOS 5.1.1 running devices, excluding the third-generation Apple TV. The Chronic iOS Dev-team have provided the necessary updates to their Absinthe iOS Tool (the tool who was responsible in jailbreaking the iPhone 4S and iPad 2 (on iOS 5.x) for the first time). So if you want to know What Absinthe 2.0 Untethered Jailbreak can do to Hack, Unlock and Jailbreak iOS 5.1.1 for iPhone 4S, iPhone 4, iPhone 3GS, iPad 3, iPad 2, iPad 1, iPod 4G Touch, iPod 3G Touch and Apple TV 2G devices and how it gives full access to your Apple iDevices, read the following official statement of iPhone Dev-team to know more about Absinthe 2.0 Untethered Jailbreak method. What is Absinthe 2.0 Untethered Jailbreak? Absinthe is an extremely simple GUI tool which allows users to inject the necessary files into their Apple devices so that they can benefit from the untethered jailbreak running any iOS Firmwares. 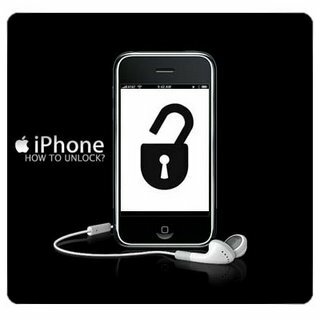 Now let’s start the Tutorial and Guidelines to Unlock and Jailbreak iOS 5.1.1 Untethered with Absinthe 2.0 for iPhone 4S, iPhone 4, iPhone 3GS, iPad 3, iPad 2, iPad 1, iPod 4G Touch, iPod 3G Touch and Apple TV 2G. How to Jailbreak and Unlock Apple iOS 5.1.1 Untethered with Absinthe 2.0? Download the tool package provided above and then follow the following simple steps to Jailbreak and Unlock Apple iOS 5.1.1 Untethered running on iPhone 4S, iPhone 4, iPhone 3GS, iPad 3, iPad 2, iPad 1, iPod 4G Touch, iPod 3G Touch and Apple TV 2G. Step 1: Download Absinthe v2.0 for Windows, Mac OS X and Linux from the above given links. Step 3: Launch Absinthe v2.0 which you downloaded in Step 1. Step 4: Absinthe v2.0 will detect your iOS device instantly, click on the Jailbreak button once you device is detected by Absinthe. 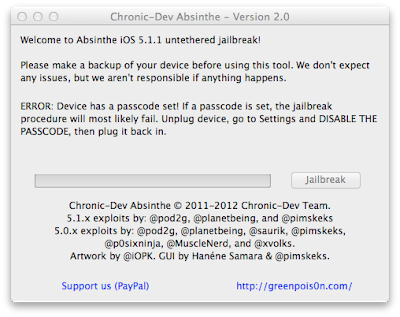 Step 5: Absinthe will start jailbreak your iOS device untethered on iOS 5.1.1, just sit back and relax. Congratulations!! you have protected your Apple devices and you will never stuck on Apple logo again and you have successfully Untethered Jailbreak iOS 5.1.1. If everything goes well, you should now have an untethered jailbreak on your iPhone 4S, iPhone 4, iPhone 3GS, iPad 3, iPad 2, iPad 1, iPod 4G Touch, iPod 3G Touch and Apple TV 2G iOS devices. Remember, that this Jailbreak only works with iOS 5.1.1; it won’t work with any other iOS firmware version.